This week's feature was the Back Alley Woodfire BBQ and Grill on Augusta Avenue in Toronto's Kensington Market. It's a delicious whiff of the spices transported all along the Silk Road from Beijing to Rome. This week featured a profile of Kensington Market in downtown Toronto, a district with a rich and colourful multicultural history. My guide was my cousin, Bill Genova, who offers tours of Kensington and other important Toronto neighbourhoods. He is a true storyteller loaded with fun facts and figures. You can check out his tours at www.genovatours.com. Another Kensington Market link: We Love The Kensington Market. Unfortunately, the photo links on this site lead to very small thumbnails. Here's a better link for history and current news, Kensington Alive. Today I profiled the Portugeuse Cheese Company in Toronto, as well as Julia Rogers, a Slow Food Member, also a member of the Ontario Cheese Society and part of Cheese Culture, a company that offers consulting and education focused on the world of cheese. Fresh and Modern Recipes from Aristedes' Kitchen is by renowned restaurateur Aristedes Pasparakis, who created several restaurants in Vancouver, Calgary and Toronto. Published by Harper Collins Canada at $26.95, but you can save over $8.00 by ordering it at Amazon.ca. Aristedes is a larger-than-life character who led me through a partial recounting of his life as we strolled along Danforth Avenue in Toronto. For the full walk, listen to my latest podcast. 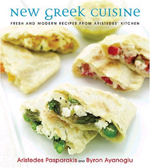 To win one of two New Greek Cuisine cookbooks, visit my blog and tell me about your favourite ethnic food. Deadline is noon PT, April 11th.